Baseball's back! 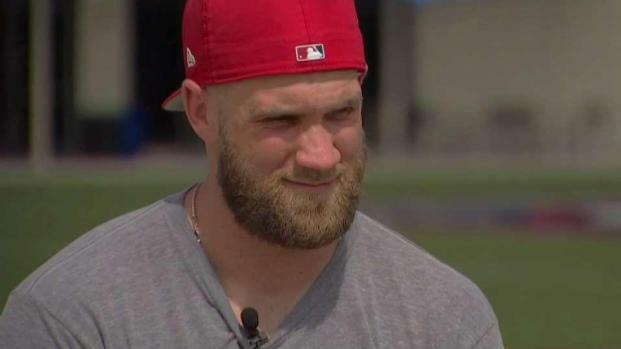 The Washington Nationals are gearing up for their home opener Thursday. The Nats will face off against the New York Mets; first pitch is scheduled for 1:05 p.m. If you're headed to Nats Park, here's what you need to know about weather, the newest food and drinks (adult juice packs!) and more. Will you need to lug an umbrella with you? Probably not, but you will want to bring some cold-weather gear. Thursday is shaping up to be sunny, breezy and cool, Storm Team4 Meteorologist Amelia Draper said Tuesday. Temps will likely be in the low to mid 50s. Make sure you grab a jacket (or Nats hoodie), and if your seats are in the shade, you'll probably want to bring along some gloves as well. When should you get there? The Center Field Gate will open two hours before the game, and on Thursdays, Fridays, Saturdays and Sundays, so does the Budweiser Terrace area. That means you can enter as early as 11:05 a.m. for the home opener. All other gates will open an hour and a half hour before first pitch. Stephen Strasburg will be starting off the day for the Nats, according to the team's Probable Pitchers page. He's had a solid start to the season thus far, the Nats said, striking out seven and limiting the Cincinnati Reds to three runs (one earned) in 6 1/3 innings. Yes! The first 25,000 fans to enter will each score a 2018 schedule T-shirt. Other freebies this season will include Sean Doolittle bobbleheads (April 13), Nats tote bags (May 2) and a Max Scherzer eye patch (for fans age 12 and younger; June 24) . Check out the Nats' promotional days for the rest of the season online here. Special events will include Jackie Robinson & Black Heritage Day (April 15), Pups in the Park (April 8 and 29, May 19 and June 23), and Military Appreciation Day. 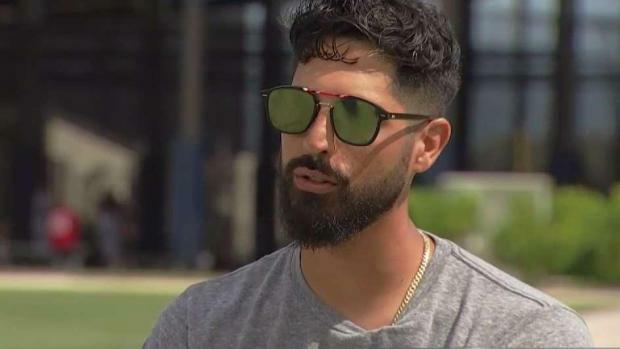 NBC4 Sports' Moises Linares sat down with Washington Nationals Manager Dave Martinez and pitcher Gio Gonzalez to get to know more about them off the field. 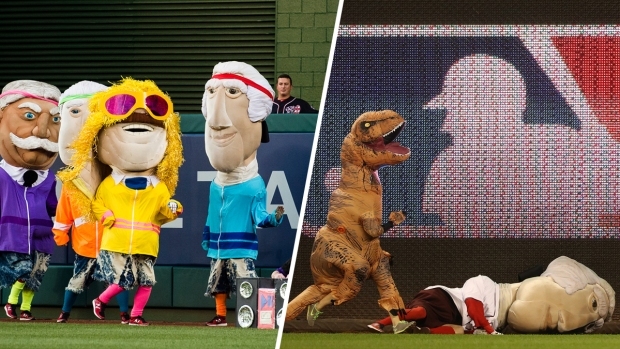 What else is happening during the home opener? Deputy First Class Blaine Gaskill, the school resource officer who responded and brought a quick end to the fatal shooting at Great Mills High School last month, will throw the ceremonial first pitch. The VFA-32 Swordsmen from Naval Air Station Oceana, Virginia Beach, will conduct a flyover in F/18 Super Hornet Jets. The lineup card will be delivered by Reston native Maame Biney, an Olympic short track speed skater who competed at the 2018 PyeongChang Games, and Frederick native Noah Grove, who won the gold in sled hockey at the 2018 Paralympic Games. 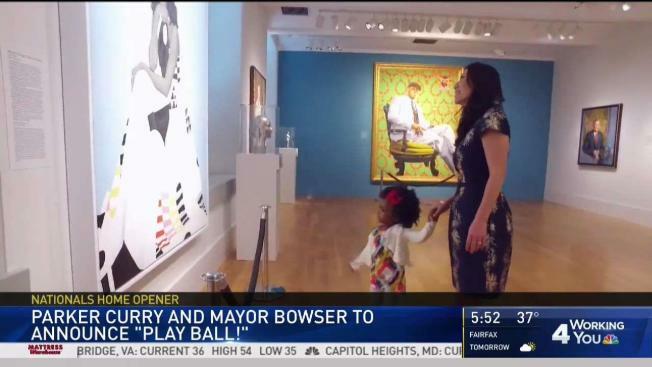 D.C. Mayor Muriel Bowser will give the "play ball!" announcement. Max Scherzer will receive the Baseball Writers' Association of America 2017 National League Cy Young Award; Daniel Murphy will get the 2017 Silver Slugger Award, and Ryan Zimmerman will receive the 2017 Players Choice Award for Comeback Player of the Year. What's there to eat in the stadium? Nathan's is now the official hot dog vendor of Nats Park. Beyond that, there's there's Ben's Chili Bowl, Chesapeake Crab Cake Company, Enzo's Pizza, Shake Shack and many more along the main concourse. For dessert lovers (so... everyone), there's Breyer's Ice Cream, Capitol Candy, Dippin' Dots, Dolci Gelati, and more. If booze is what you're looking for, check out Base Line Brews, Blue Point Brewing Co., Budweiser Brew House, District Drafts... and there are plenty more bars to choose from -- we just don't want to overwhelm you. Check out our roundup of some of the newest food and drink options at the park, including adult juice packs and crab grilled cheese. What's there to eat nearby? If you don't want to eat inside the park, you're still in luck. There are tons of great restaurants around Nats Park where you can enjoy anything from a quick, casual bite to a slower-paced, more luxurious meal. Chix (1210 Half St. SE) serves Latin food such as Peruvian and Colombian chicken, black beans and rice. They also serve soups and salads; plus there's a kids' menu. If you just want a burger but don't want to pay an arm and a leg for it, there's also a Five Guys nearby (1100 New Jersey Ave. SE), as well as another Shake Shack (54 M St. SE) that's not in the park. If you're in need of wings, take note that there's a Buffalo Wild Wings (1220 Half St. SE) close to the park. If Korean-inspired food is more up your alley, check out Takorean (1212 4th St. SE) or Bonchon (1015 Half St. SE). Takorean, which got its start in the food truck world, is a fast-casual service restaurant known for its unique Korean tacos. Bonchon is known for its Korean fried chicken (oh, and there's a bar). Both spots are less than a half-mile away. How about some Italian or Mexican food with outdoor seating that offers a gorgeous view of the waterfront? Hit up Osteria Morini or Agua 301 (both at 301 Water Street SE). Bryce Harper sat down with Moises Linares at spring training in West Palm Beach, Florida, to talk about the season ahead. What should you know about security? What should you leave at home? Everyone attending the game must go through metal detectors or get checked with a handheld metal detector. Either way, make sure you give yourself enough time to get through the line. Security agents will check your bags, so try to pack light or bring a smaller bag. Bags can't be any larger than 16"x16"x8," which is about the size of a tote bag. Leave behind metal, plastic and glass containers because they are not allowed. You can bring in one water bottle. Also, if you decide to bring an umbrella, make sure it's collapsible. Otherwise, it will not be allowed in the park. Hard coolers and ice chests are also prohibited. See more prohibited items here. Take Metro: Riding the Green line to the Navy Yard station is usually an easy bet (if somewhat crowded on game days). The station is just half a block from Nats Park, but you might want to use alternate stations such as Waterfront or Capitol South to avoid crowds. The Waterfront station is on the Green Line, and it's less than a mile from Nats Park. The Capitol South station on the Orange, Blue and Silver lines, located exactly one mile from the park. Take a bus: Several Metrobus routes serve the ballpark: the 74, P6, V1, V4, A9 and W9 lines, according to WMATA's website. You can use WMATA's trip planner here. Take a fancier bus: If Metrobus is not your top pick, consider the D.C. Circulator, which is often less crowded than the Metro. The Union Station-Navy Yard route runs every 10 minutes to and from Union Station (Metro's Red Line). It also stops at the Eastern Market station (Blue, Orange and Silver lines) on the way to Nats Park; see a map of the complete route here. Extended Circulator service will run during all Nationals home games. Metro riders can transfer to the Circulator for just 50 cents. Ride a bike: If you're an avid cyclist -- or you've always wanted to be -- ride your bike. You can use the free bike valet service in Garage C at the corner of N & 1st streets SE. The valet is on N Street just left of the entrance. You'll also find 250 bike racks around the exterior of the park. D.C.'s dockless bike rentals and scooters are another option -- check out the sites (and apps) for Lime Bike and Lime-S, Jump, Mobike and Spin. Take a taxi, Uber or Lyft: Taking a taxi, Uber or Lyft are other options. After the game, you can find the taxicab pickup area on the north side of M Street SE, between S. Capitol and Half street SE. We just hope you're not in a hurry because it may be a little congested with traffic after the game. Add some spice to your life and take a water taxi: The Potomac Riverboat Company offers water taxi service from Old Town Alexandria to the Diamond Teague Park Pier. The pier is across from Nationals Park. See pricing and schedules here. Last but not least, you can drive: If you feel like paying more than $30 for parking, possibly getting stuck in traffic and competing with other cars for a good parking spot... feel free to drive. There are parking lots around the stadium.